Boxed roses are the latest trend, and have taken over Instagram. Although they are so beautiful, they can be very expensive. 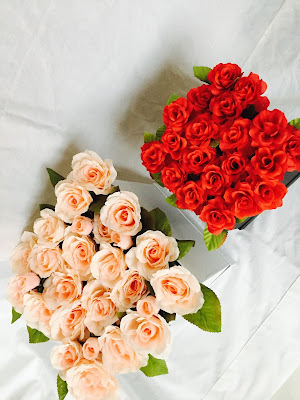 For Valentine's Day, I decided to do a *cheap* DIY boxed roses craft, and it's super easy to do. Follow these steps, and you'll have a Valentine in no time. Step one: Buy a box of your choice. I bought one small black box and one medium white box from Michaels. They were $3.99 and $4.99, with 50% off in store, as well as a 20% off coupon. We all know I love a good discount, so I was so happy about this. Step two: Buy fake flowers of your choice. I got small red roses for the black box for $1 each, and medium sized peach roses for the white box for $4 each from Michaels, as well. Step three: Buy a foam board/ piece. I had some foam laying around my house, so I didn't have to buy any. I cut the foam to the size of the bottom of both boxes, and then placed it inside each. Step four: Stick the flowers into the foam board. Step five: Finish up, then repeat on second box. This is what your final outcome should look like! I will be honest, this wasn't the fastest craft to make. It requires some patience, but all in all it really didn't take too long. I would definitely reccommend if you've been dying for one of these boxed roses off Instagram like me- now I have my own that will last forever!